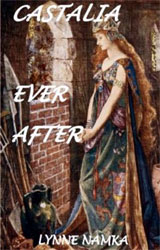 Castalia Ever After is a tale of seeking true happiness written in the romantic language of long ago. Enchantments, riddles, metaphors, quests and a finding of the self through a long grueling search. In this universal story of the Heroine’s Journey, Castalia seeks the answers to a riddle and faces the darkness of her own nature as well as supernatural adversaries. The wounded woman archetype on a healing journey is an allegory every woman can relate to. The tale uncannily cuts right to the heart of the reader in her own heroine’s journey. The tapestry of myths and symbols woven into this parable gives insight into the intricacy of the human heart and the need to love and be loved and speaks to the healing of the collective unconsciousness in returning to the Divine Feminine. Lynne Namka, Ed. D. is a storyteller, shaman and psychologist with a mission of sending ideas of healthy living and the spiritual journey for those seeking true happiness out into the world.